We have a mystery to solve! Join LEGO Scooby-Doo, Daphne, Velma, Fred, and Shaggy as they uncover clues, unmask villains, and put together the brick pieces of puzzles old and new. 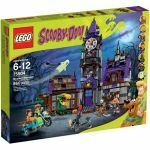 Explore mysterious old places, investigate monster sightings, and become an expert sleuth with LEGO® Scooby-Doo products.